There will be a Hoyden meetup on Sunday March 8. Date and time: Sunday 8th March, 12:00 noon. Who: There’s no level of existing involvement in Hoyden About Town required. Creators, commenters, lurkers, newcomers and familiar faces all welcome. Friends, partners and children all welcome. Wet weather: it’s a partly indoor venue, so the meetup will go ahead as planned. The meetup coincides with International Women’s Day, and with the All About Women festival at the Sydney Opera House, with speakers including Anita Sarkeesian and Rosie Batty. (Timetable.) Tickets to All About Women are general admission and now on sale: if you want to go, please book your own tickets. Circular Quay train station is a 400m walk away. Many bus lines terminate south of the Circular Quay train station, about a 500m walk away. 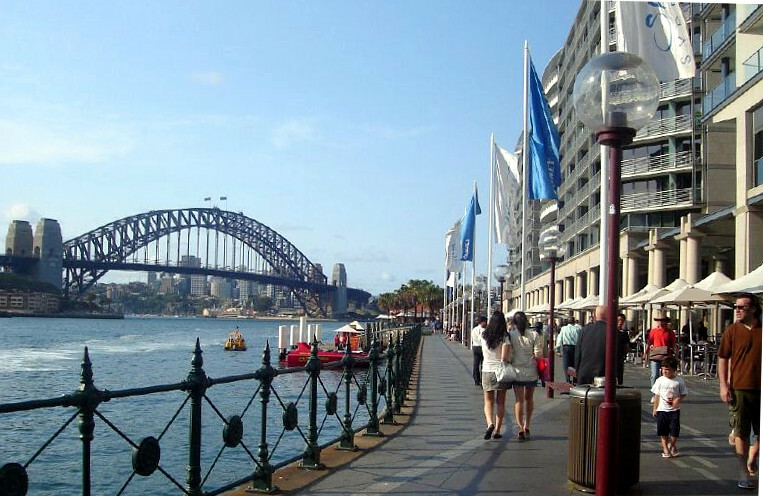 Circular Quay is also the main terminal for Sydney Ferries. The paid Sydney Opera House car park is the nearest parking venue with substantial spaces. Weekend parking is a flat $15. The Cafe is step-free and has level floors. The Cafe staff tell me that the entire space is wheel accessible and there is an accessible toilet. Children are welcome, but the Guylian Cafe does not have specifically children’s entertainment. A quick should-be-obvious: respect people’s pseudonyms. Many people will use their meatspace name at the meetup (although if you want to introduce yourself by a pseudonym feel free). That doesn’t mean you can use their meatspace name if you blog/tweet about the meetup. Again, should-be-obvious: if you come to the event please do not take photographs of participants without their express permission (or that of their parent/guardian in the case of young children). In particular, if you’re intending to publish it on the web or elsewhere let them know before taking the photograph. Full photo credits: the photograph of East Circular Quay is by Kevin Gibbons/Australia Photos, licensed Creative Commons Attribution 2.0 on Flickr, and was cropped, colour-adjusted and rotated by the author of this post.